Chari T. Hawkins is a stay at home mom of twins with a passion for God and inspiring others! She has always loved to help others from her young days of volunteering as a child. 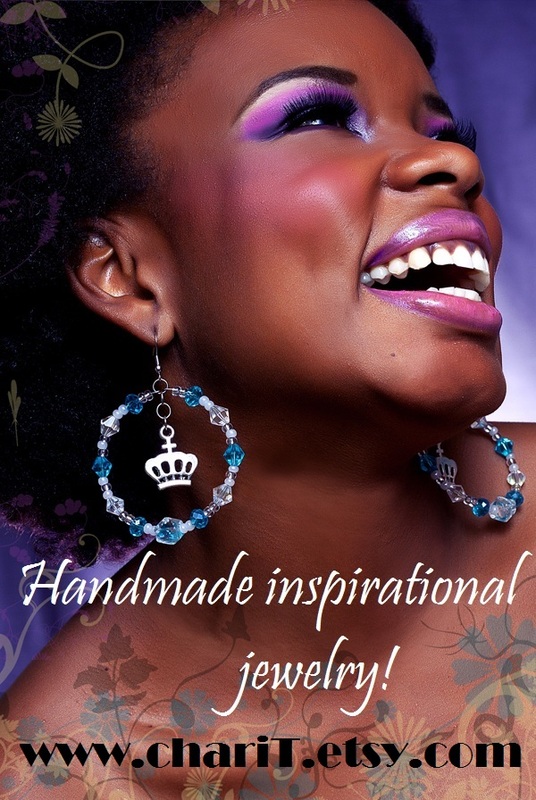 Her love for the arts including dancing, singing, and acting has branched out into a new God given talent; unique handmade inspirational jewelry! Through her blog http://charitsinspirationalcreations.blogspot.com/, and facebook page https://www.facebook.com/ChariTs.Inspirational.Creations, she share inspirational tips, quotes, and of course her love for making inspirational jewelry! Chari aspires to jump back into her background of performing and speak to others are being motivated to live their passion! We interviewed Chari for this edition of women entrepreneurs and here are her answers on life and her business! Owning a business comes with new challenges and obstacles each day. Every time I feel that fear creeping up, I remind myself that I can do ALL things through Him…ALL Things! If I let the negative feelings take over, I will be back where I started and I don’t want to go backward, only forward! ChariT’s Inspirational Creations unique handmade inspirational jewelry made to uplift the fashionista in You! Religious themes, the arts, going green, motherhood, cause awareness, and sorority/organizational jewelry; we do it all! Beautiful jewelry with a positive message! I have always wanted to own my own business. The birth of my babies made me take a look at my life and what I really wanted to do. I wanted to be God’s vessel and inspire others, but I didn’t know how. After much prayer and consideration, I decided since I liked unique jewelry and liked inspiring others, I would make my own jewelry with an inspirational twist! Fear of rejection, fear that I couldn’t do it, wouldn’t do it. But God has and continues to push me through! I market ChariT’s Inspirational Creations on facebook, twitter, youtube, my blog, and Flickr. I also leave flyers at libraries, have flyers placed in event goodie bags related to my target market and attend inspirational events to network. Creative strategies? Not at this time. I need some creative marketing strategies! Lol. Time management! I am currently working on managing my time better so I can get things done more effectively. I have created a schedule; I just need to stick to it! Lol. I set aside a certain amount of time that I spend with my hubby and babies. Still a work in progress! 😉 Prayer and communication helps too! It doesn’t really affect my relationships, though I can be on the computer a bit much! Lol. Stay inspired! Always be willing to learn from others and grow. Research is key in keeping up with the ever changing world. Times get hard, but you can do it! God put you here for a purpose, and your purpose is to live it! Thanks, ChariT’s Inspirational Creations! YOU ROCK!